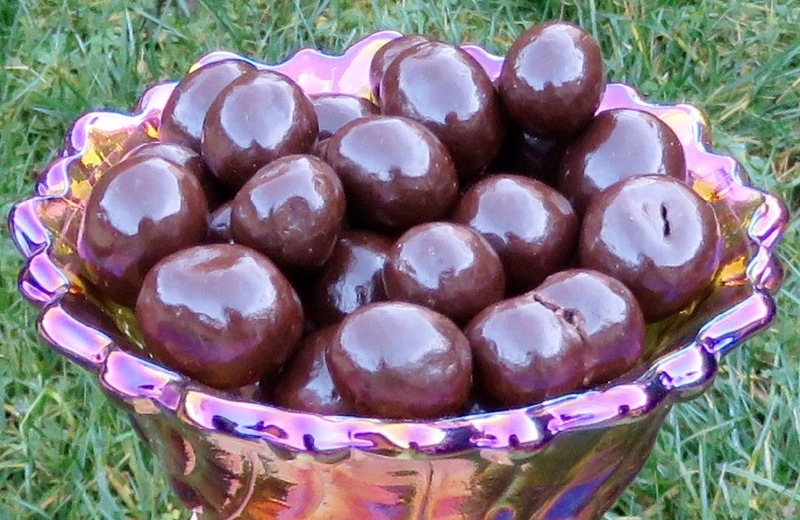 Welcome to Day #6 of Crunchy Chocolate Week. 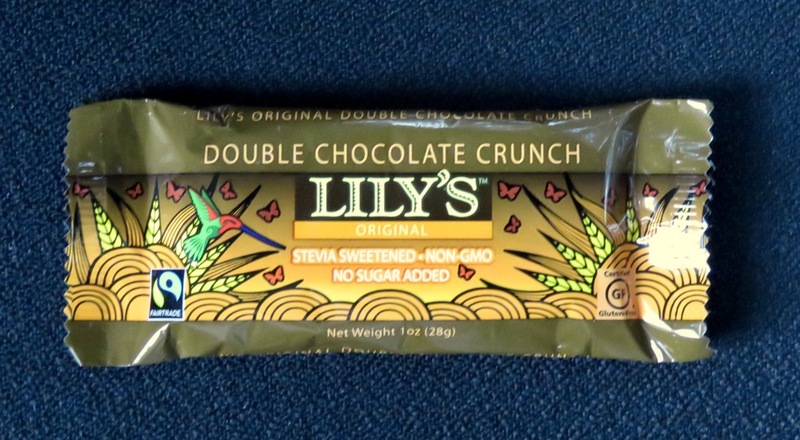 Today's Double Chocolate Crunch bar was distributed by Lily's Sweets, LLC (King of Prussia, PA). 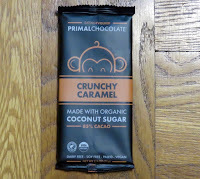 The crunch in this bar was supplied by crisped brown rice and the texture was a hearty mix of creamy and crunchy. 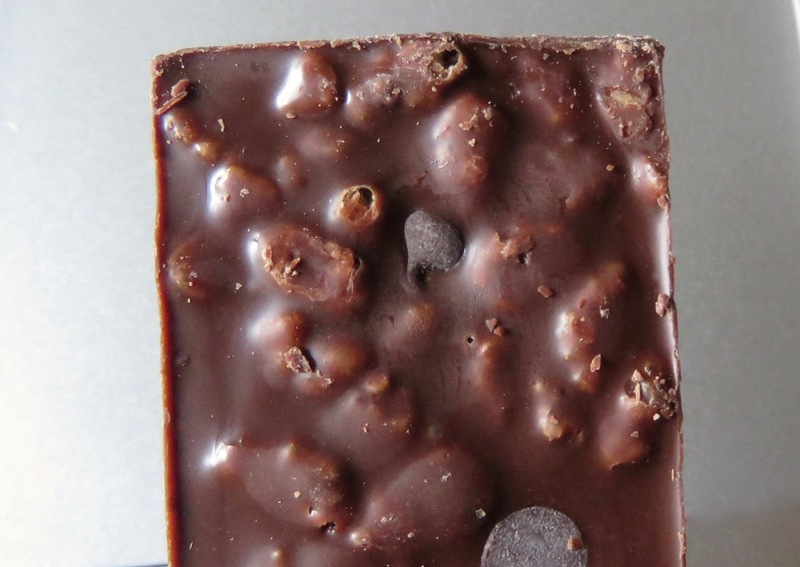 Tiny chocolate chips were embedded in this bar as well. 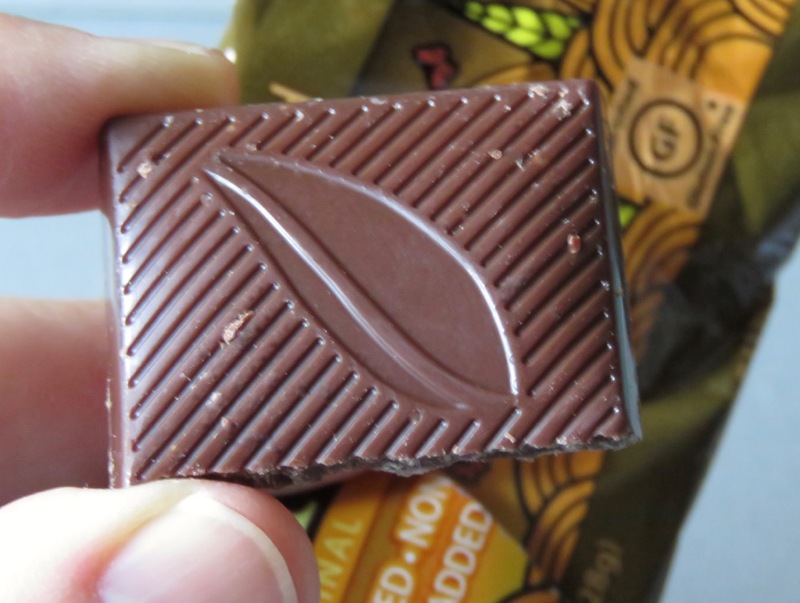 This Non-GMO, certified gluten free 40% chocolate bar was sweetened with stevia and brown rice syrup. 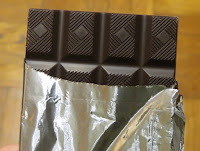 Welcome to Day #5 of Crunchy Chocolate Theme Week. 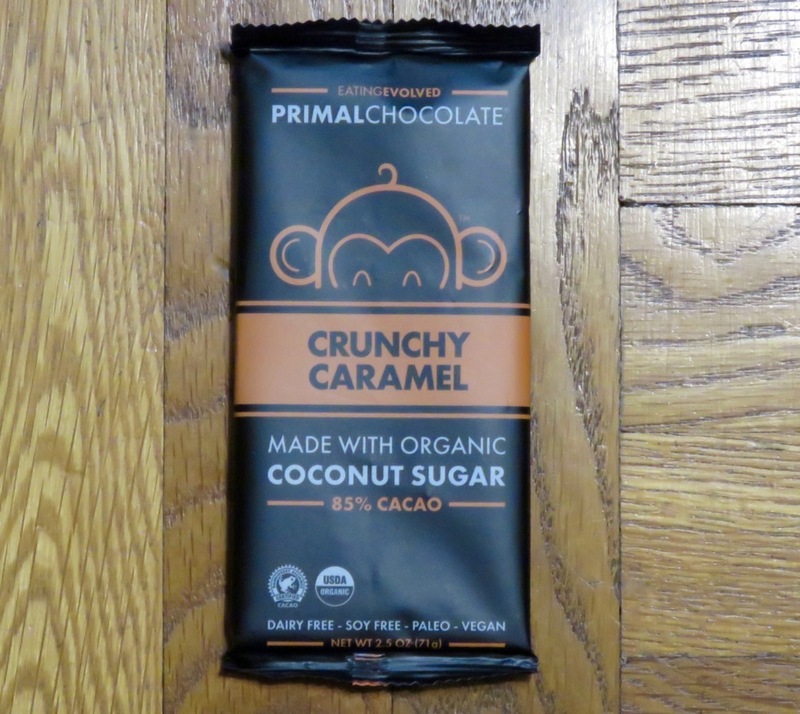 The Primal Chocolate Crunchy Caramel with Organic Coconut Sugar 85% Cacao (bar) was made by Eating Evolved (Setauket, NY). 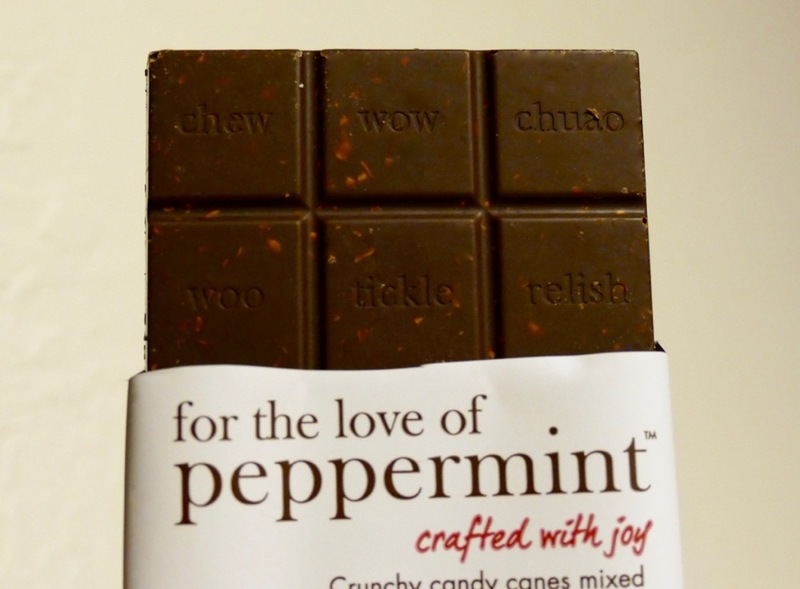 The company offers a line of Primal Chocolate bars, Coconut Butter cups, as well as customized chocolate bars. 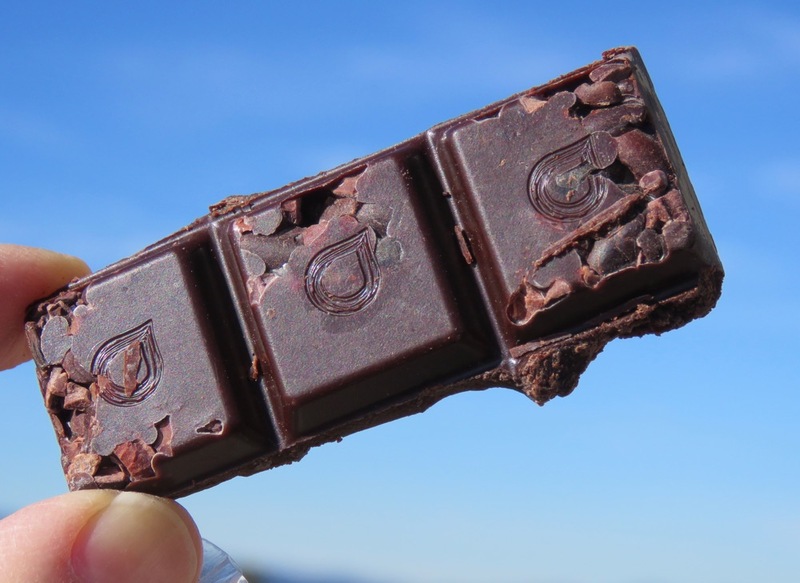 Today's dairy and soy free, paleo, vegan, 4-ingredient, organic bar delivered a high-percentage (85%) cacao experience, with a very light touch of coconut and maple sugar sweetness and crunch. Welcome to Day #4 of Crunchy Chocolate Theme Week. Today's Organic Dark Mint Bar was from Loving Earth* and "Made in Australia from Imported Ingredients." The organic cacao was sourced from Peru. 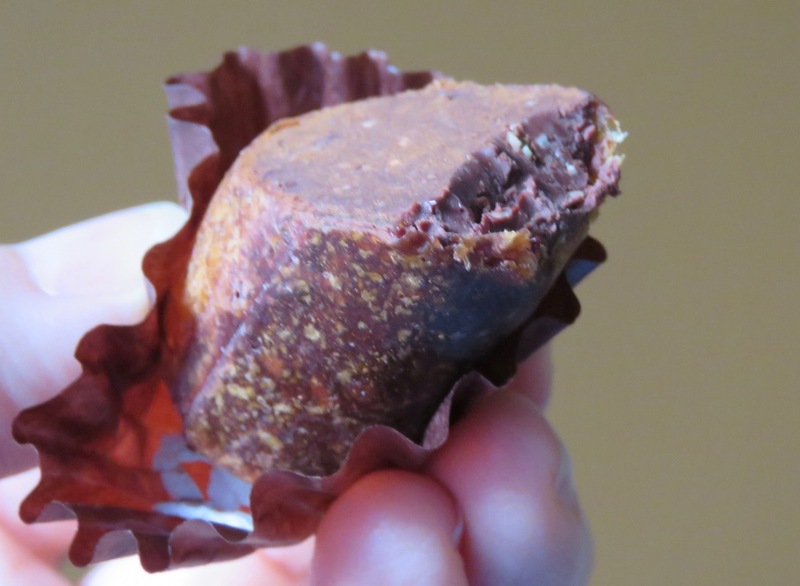 The chocolate (made with raw cacao butter and nibs) like most raw chocolates was smooth in flavor, without fully highly developed acidity or roasted flavors. 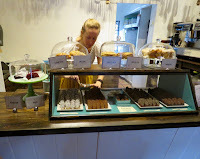 *It appears that Loving Earth is based in Upper St. Clair, PA; and the chocolate is made in Melbourne, Australia. Welcome to Day #3 of Crunchy Chocolate Theme Week. 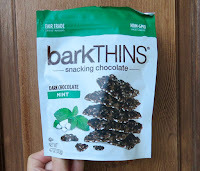 Today's Dark Chocolate barkThins were made for Ripple Brand Collective, LLC (New York, New York), which is owned by The Hershey Company (Hershey, PA). 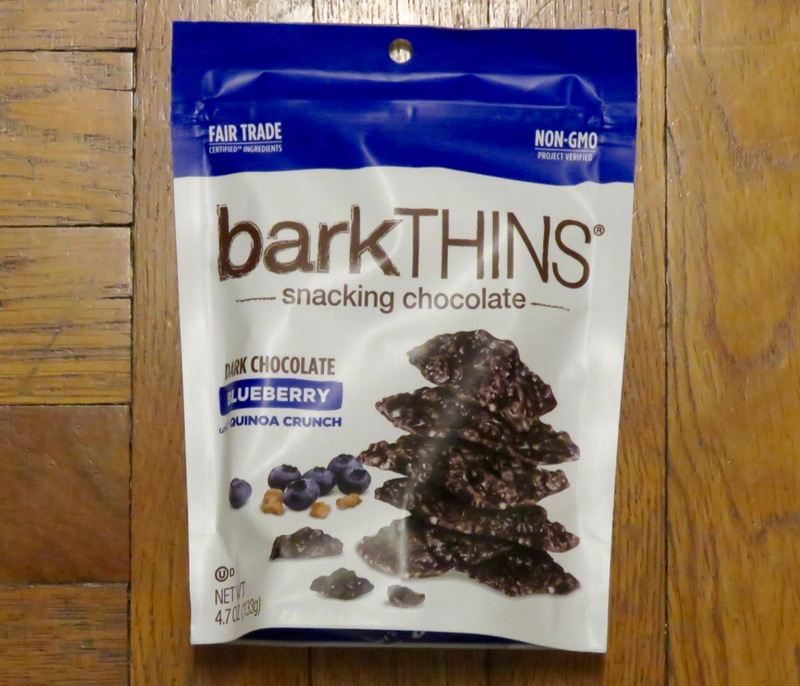 These Blueberry with Quinoa Crunch barkThins were similar to other flavors from the barkThins family. 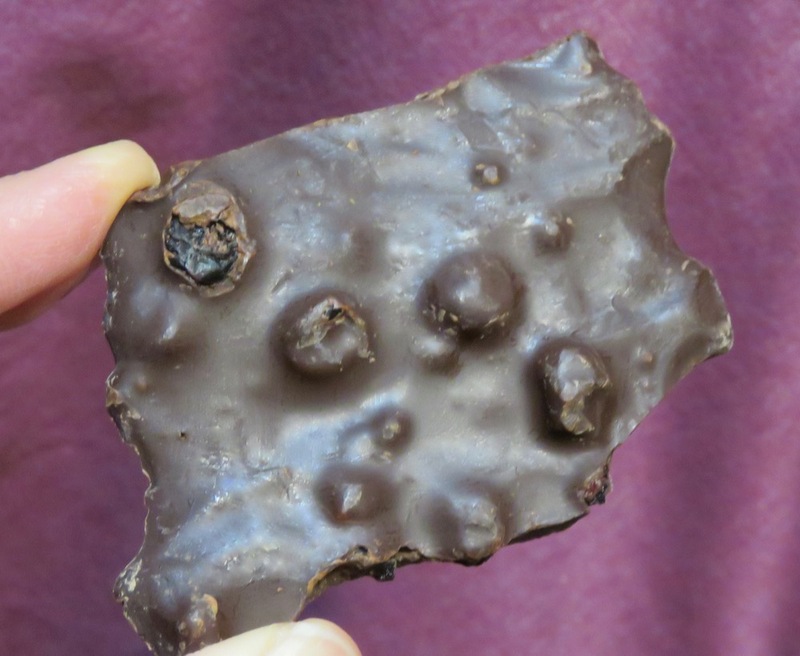 The package held a generous amount of chocolate "bark" pieces containing a flavor inclusion. 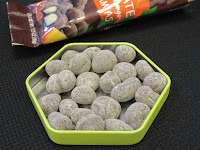 Yesterday's dark mint barkThins pieces were peppered with peppermint candy. 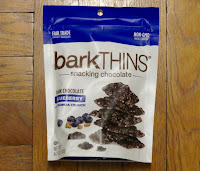 Today's barkThins contained fruit (sweetened blueberries) and gained added crunch from glazed quinoa bits. It was a balanced, satisfying flavor blend. 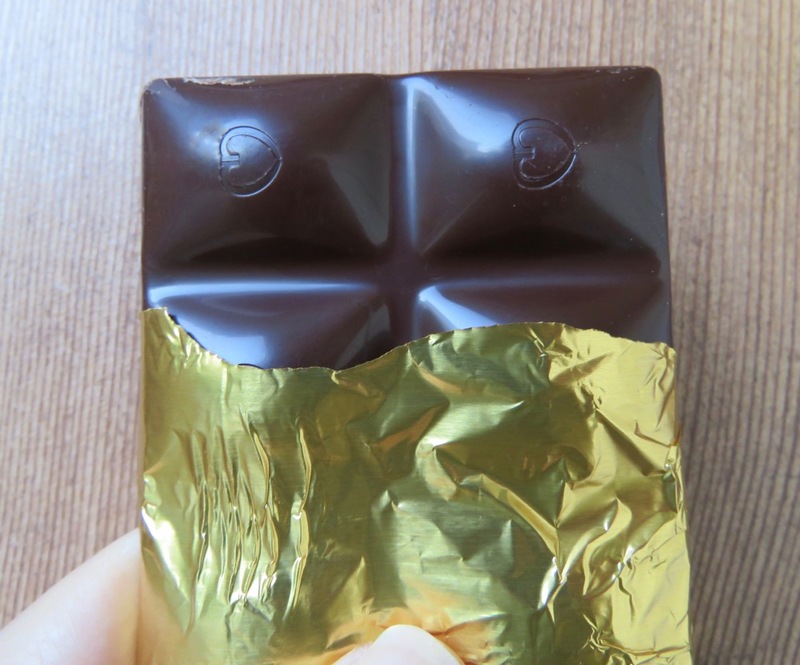 Welcome to Day #2 of Crunchy Chocolate Theme Week. 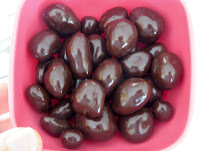 Today's Dark Chocolate Mint barkThins were "manufactured exclusively for" Ripple Brand Collective, LLC* (New York, NY). *The barkThins brand was made for Ripple Brand Collective, LLC—an entity that was purchased by The Hershey Co. in 2016. 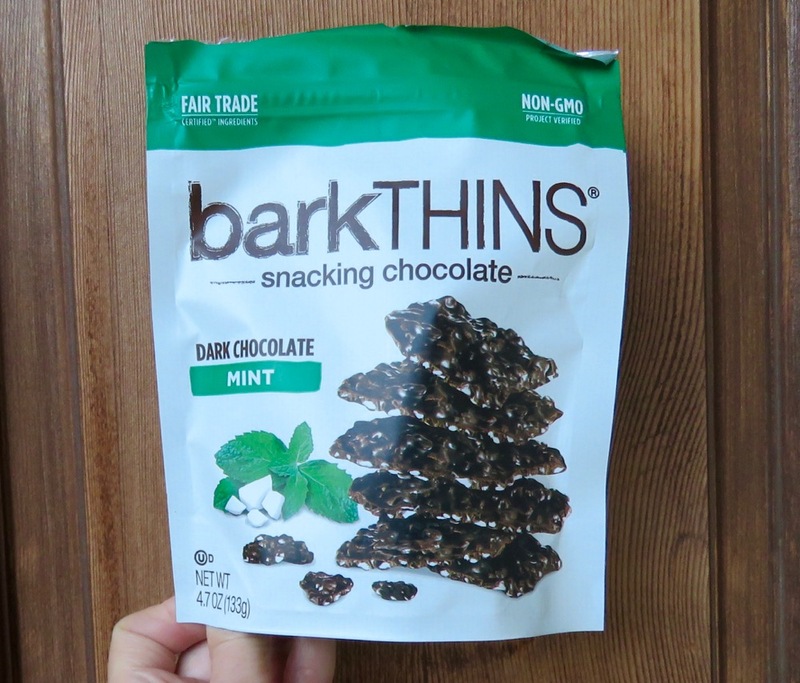 The barkThins were Non-GMO Project Verified and contained Fair Trade ingredients. Happy Holidays, and welcome to Day #1 of Crunchy Chocolate Theme Week. 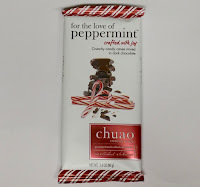 Today's "For the Love of Peppermint" (bar) was from Chuao Chocolatier (Carlsbad, CA). The company was co-founded by two Venezuelan brothers in 2002. 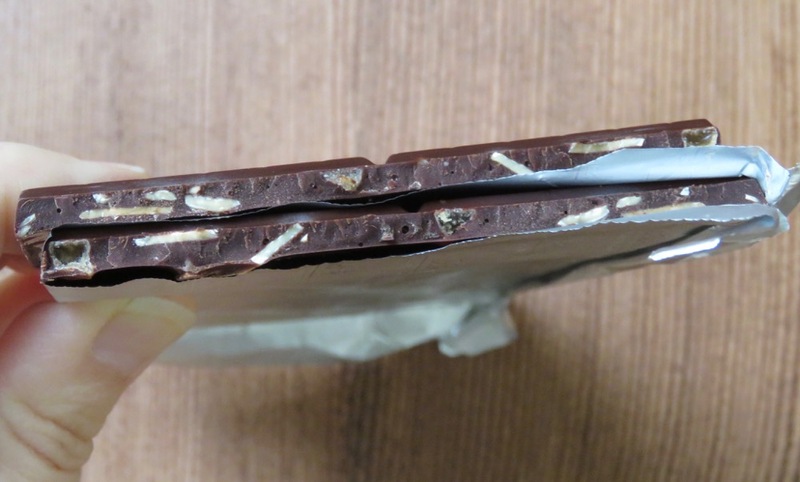 This chocolate bar was one of at least three holiday-themed bars the company has offered this season. 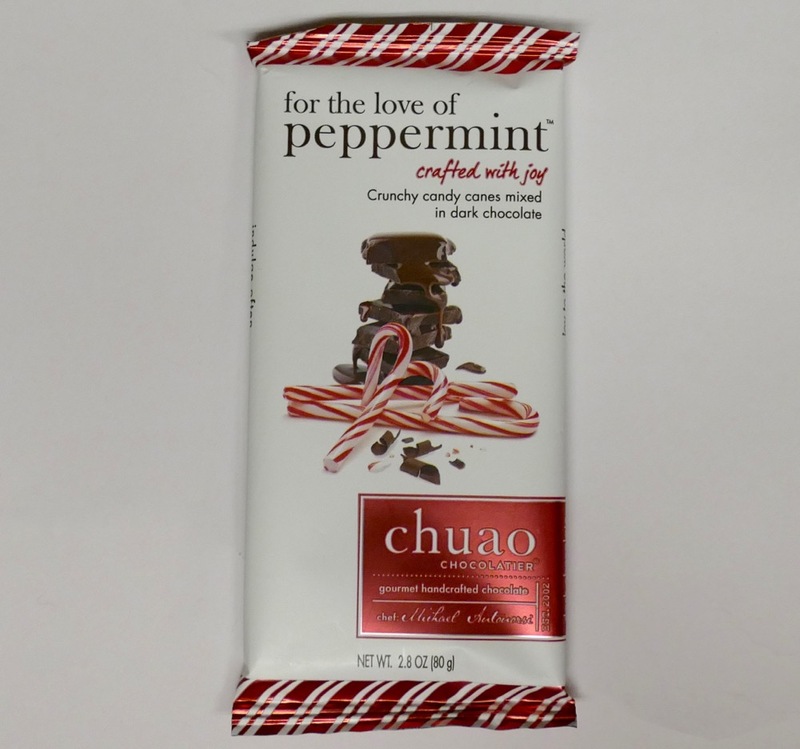 Today's bar was the company's "ode to the wonder and glee of the season...dark chocolate...mixed with crushed candy canes..."
When opening the package for this bar, the aroma of cooling peppermint wafted out. This peppermint was a prominent part of the tasting experience. 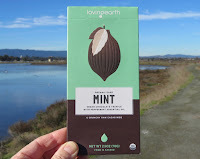 The slightly bold dark chocolate took a back seat to the sweet but powerful mint candy. The bar offered a refreshing, wake-up, holiday experience. And the candy cane bits did add crunchy texture to the otherwise smooth dark chocolate. As children, we found tangerines in our stockings on Christmas morning. 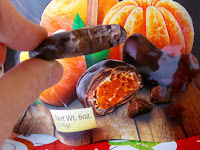 Today's dark chocolate covered tangerine pieces from Nature To Go (distributed by Food Castle Inc. (Vernon, CA)) recalled those childhood memories. 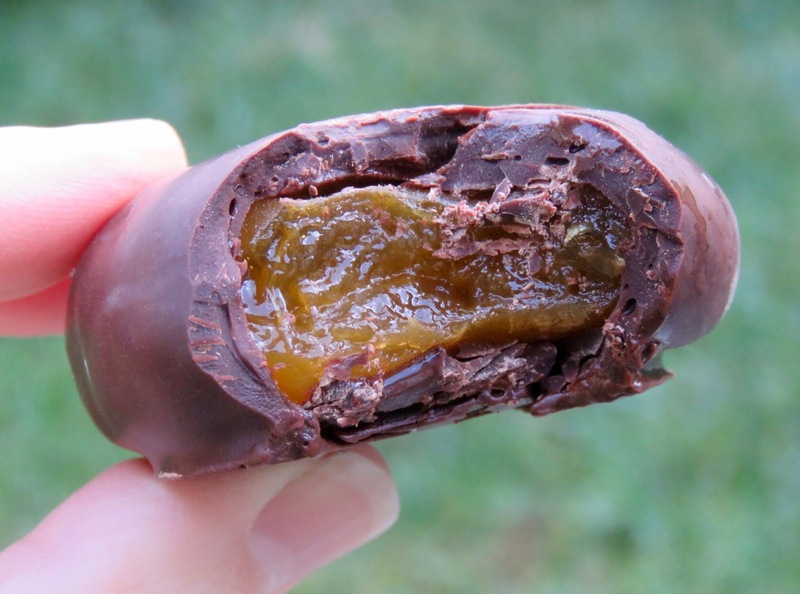 Working with preserved citrus and chocolate can be tricky. The pieces of dried tangerines enrobed in dark chocolate didn't quite match the illustration on the front of the package (they were more compressed in dried form), but were fun to try nonetheless. Even though the last Advent Calendar door is traditionally opened on Dec. 24th (Christmas Eve), I waited until Christmas morning to reveal the last of 24 milk chocolate figurines, an image of old St. Nick himself. 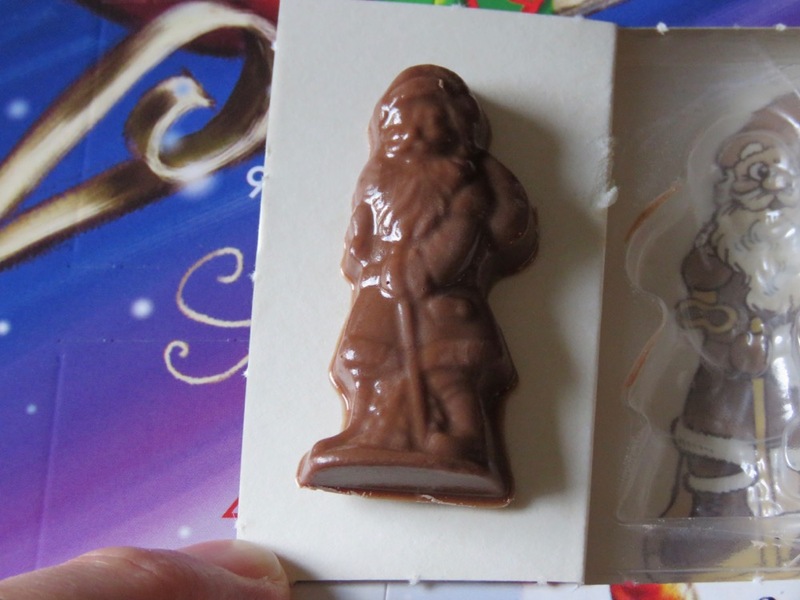 The tiny Santa milk chocolate tasted better than most chocolate novelty items, and was gone in a flash. 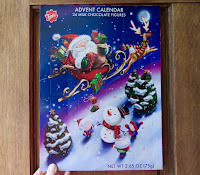 This Friedel Advent Calendar was made in Germany, Produced by Rubezahl Schokoladen GmbH. 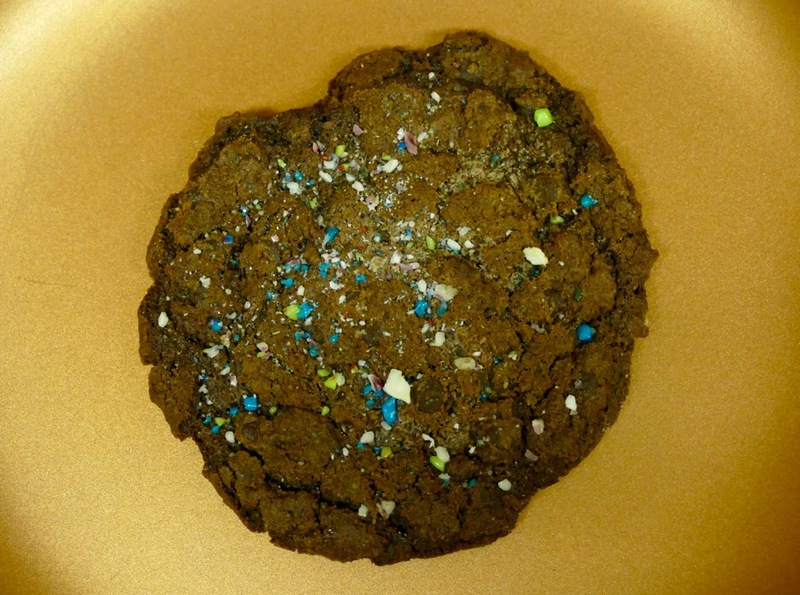 Today's Chocolate Peppermint (gluten-free) cookie was from Gracie Jones Gluten Free Bake Shop* (Palo Alto, CA). This sweet, chocolate cookie tasted like a "real" cookie (or what I remember a traditional cookie with wheat tastes like from 20 years ago**). It had just the right amount of chew and crunch and chocolate cookie flavor. A festive sprinkle of peppermint candy contributed tiny micro-bursts of mint contrast. *This gluten free bake shop, located in the heart of Silicon Valley, was first spotted many months ago with a small "Pied Piper" sign in the front—presumably a reference to a small, fictional, technology start-up featured at the heart of the television series, Silicon Valley, that was fictionally based blocks from where this shop was operating. Happily open hours have expanded since then. **Twenty years ago I stopped eating wheat and gluten. I felt (and continue to feel) much better without gluten. 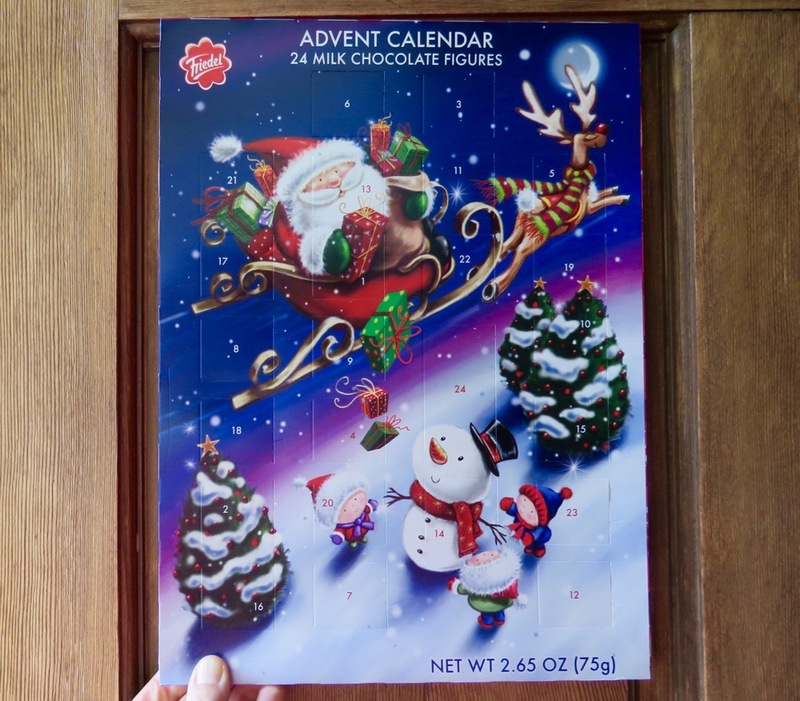 Without this hurdle to overcome, I never would have started Chocolate Banquet, or felt so grateful to have discovered 4,500+ chocolate items (or items with chocolate in them) to try over the past 12+ years, made by many wonderful people. Thank you to all. Welcome to Day #13 of Chocolate and Fruit Theme Week. 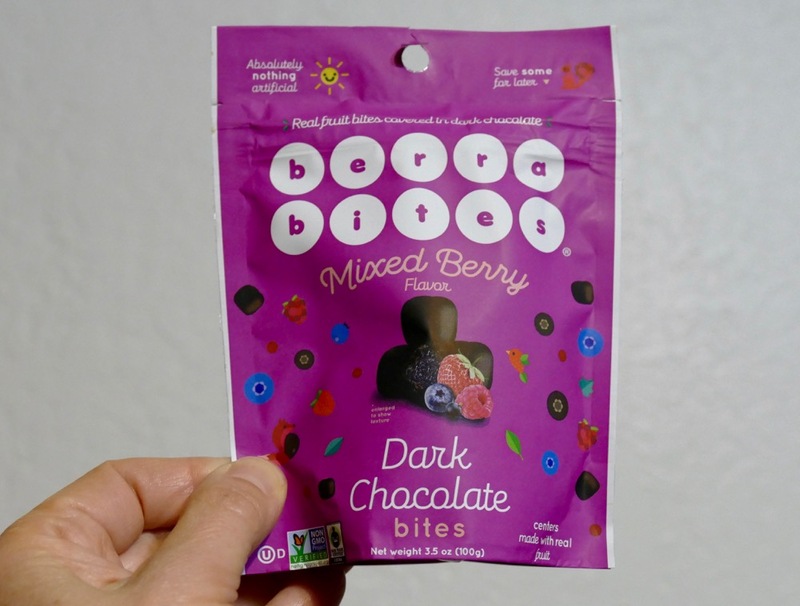 Today's Mixed Berry Dark chocolate bites were manufactured for Berra Bites (San Francisco, CA). The company is committed to avoiding use any artificial flavorings or preservatives in their offerings. These bites were made from pureed mixed apple, blueberry, raspberry, strawberry and black currant fruit pieces—creating concentrated berry fruit flavored centers, covered in dark chocolate. Welcome to Day #12 of Chocolate and Fruit Theme Week. 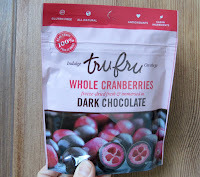 Today's Whole Cranberries in dark chocolate were from Tru Fru, LLC (South Jordan, UT). 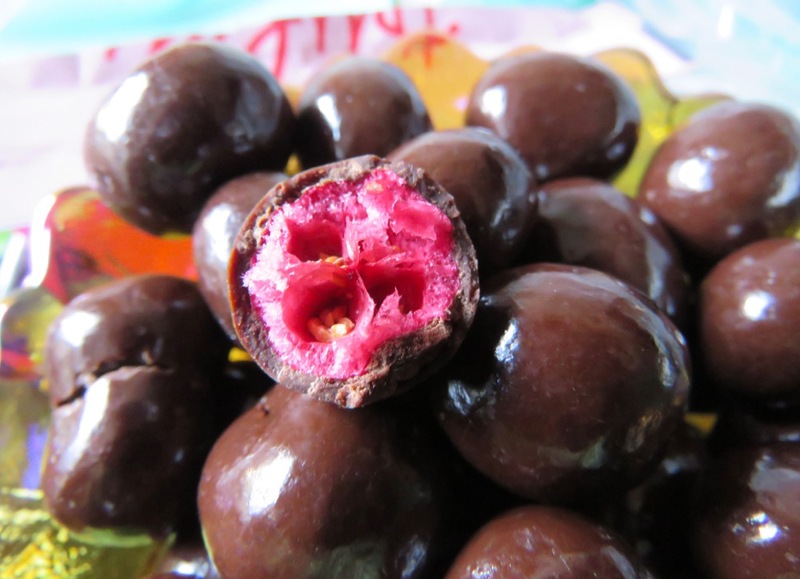 Festively colorful, naturally tart sweet, freeze-dried fresh cranberries were at the core of today's glossy ebony-colored rounds. Perfect for the holidays. 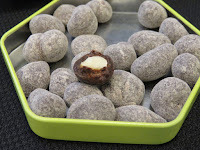 These fruit-filled confections had a dark chocolate aroma with a faint hint of coconut,* and like most chocolate-covered pieces, were finished with confectioners glaze. 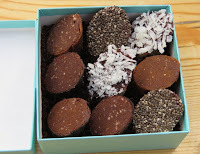 *There was no coconut listed in ingredients list, which read: Dark chocolate (sugar, chocolate liquor, cocoa butter, milkfat, soy lecithin - an emulsifier, natural vanilla flavor), cranberries, tapioca dextrin, confectioners glaze. Welcome to Day #11 of Chocolate and Fruit Theme Week. 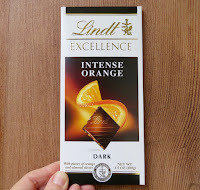 Today's Intense Orange Dark bar was from Lindt and Sprungli USA Inc. (Stratham, NH). 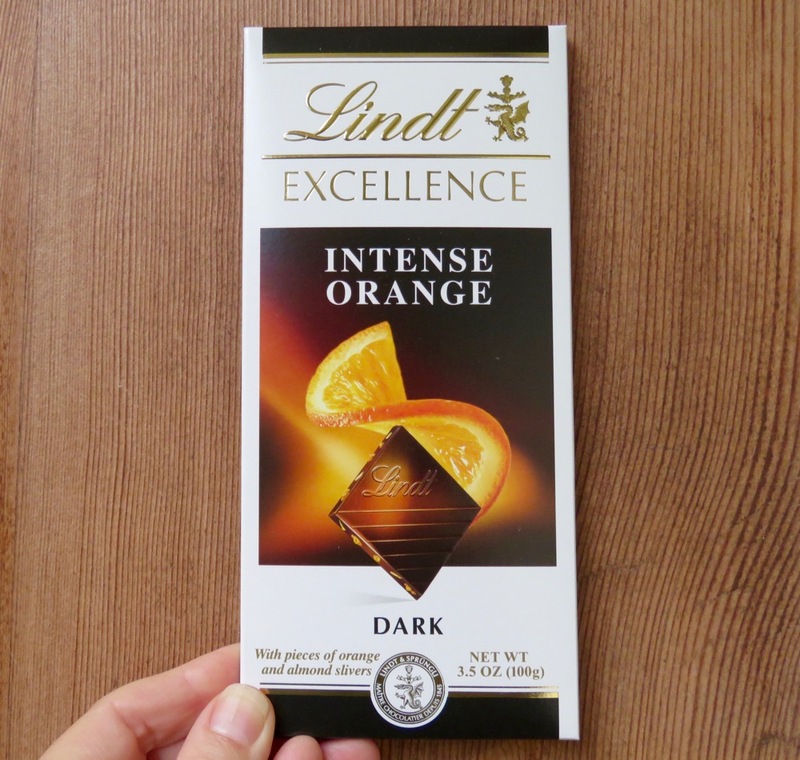 This 47% dark bar had smooth dark chocolate aroma and flavor, with dutched* sweet cocoa and faint orange notes. Bits of almond and candied orange gave the bar textural interest and tiny bursts of sweet, mild citrus (natural and artificial) flavor. The following explains what the phrase Dutched cocoa means. 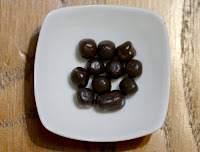 Dutched (aka alkilized, or European-style) cocoa or chocolate has been treated to reduce acidity through a process of adding an alkaline substance, thereby neutralizing acidity. This process—invented by Dutch chocolate maker, Coenraad Johannes van Houten, in 1828—is commonly used for hot cocoa mixes, ice creams, baking chocolates, and many other chocolate offerings, when natural cocoa has been determined to be too acidic. The resulting cocoa powder has a darker color and a milder flavor. Welcome to Day #10 of Chocolate and Fruit Theme Week. Today's Chocolate Bark 70% Dark Chocolate Pistachios, Dried Cranberries, Almonds from JoJo's Chocolate LLC (Orem, UT). 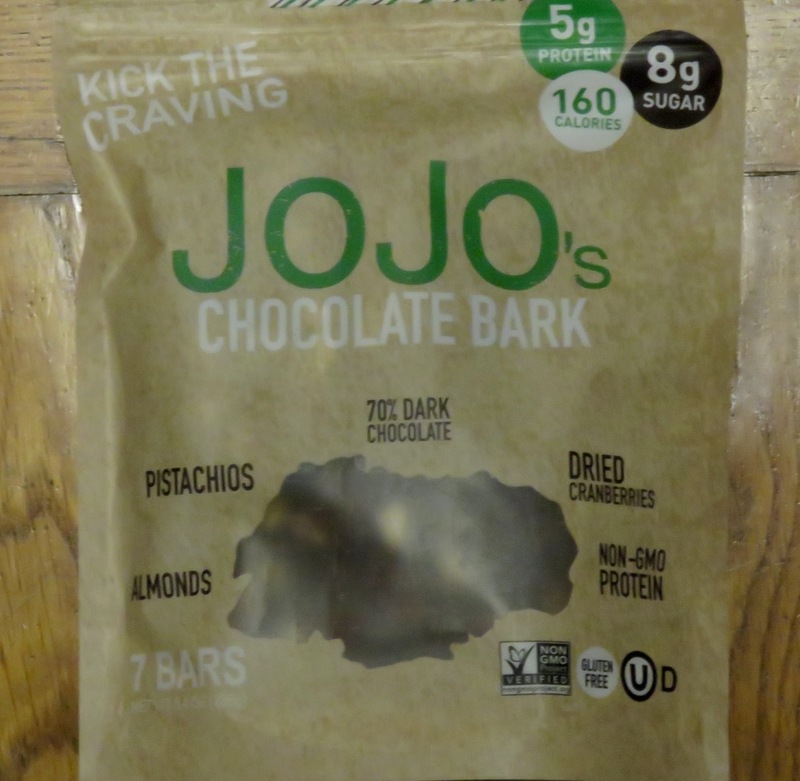 JoJo's Chocolate was created by Jodie Jones (JoJo) after being diagnosed with breast cancer in 2012. 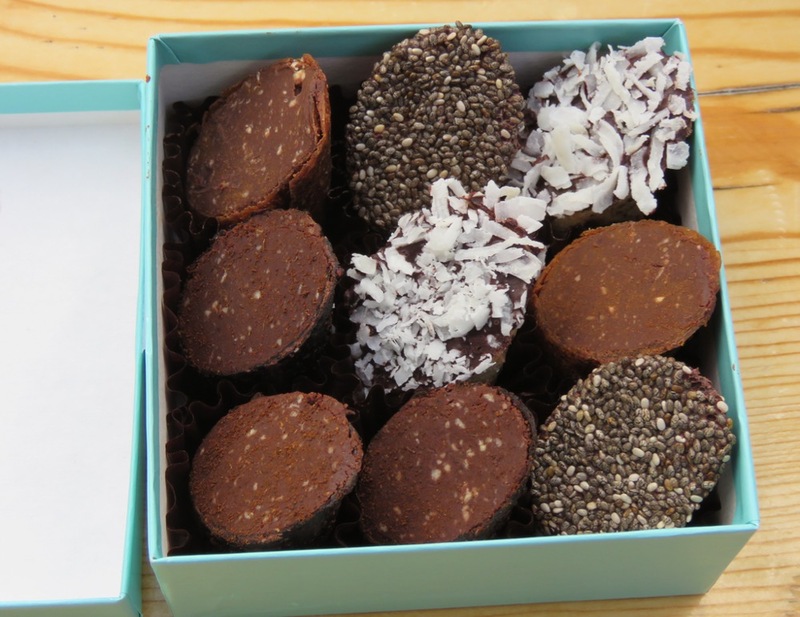 The desire to eat and snack healthier led to experimenting with batches of chocolate barks and other treats with less sugar than conventional chocolates. 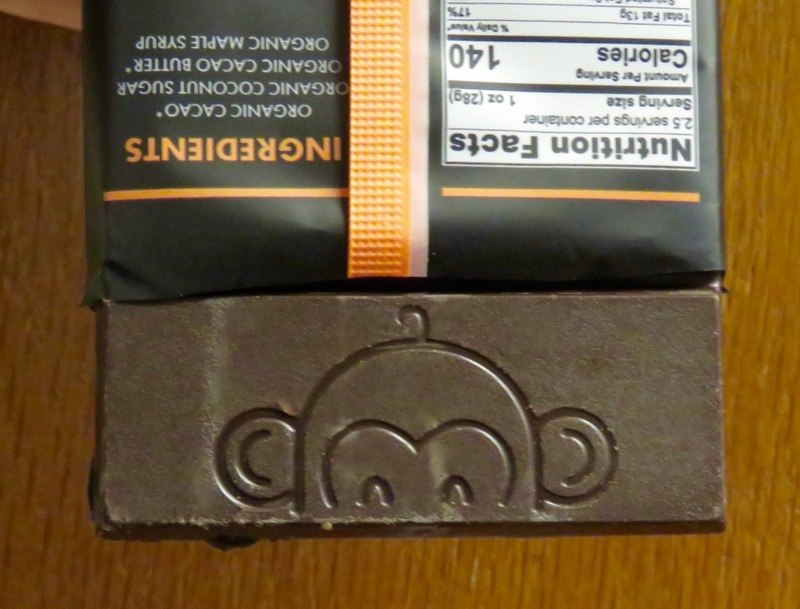 These rectangular 70% dark bars had a pleasing dark chocolate aroma with a hint of fruit. Pressed on the back of each one were dried cranberries, pistachio and almond pieces. These bars were smooth yet flavorful. And, best of all, they weren't too sweet (thank you)! 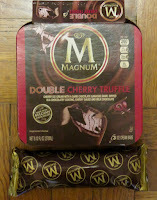 Today's Magnum Double Cherry Truffle bars were from Unilever, the ice cream colossus* based in Englewood Cliffs, NJ. 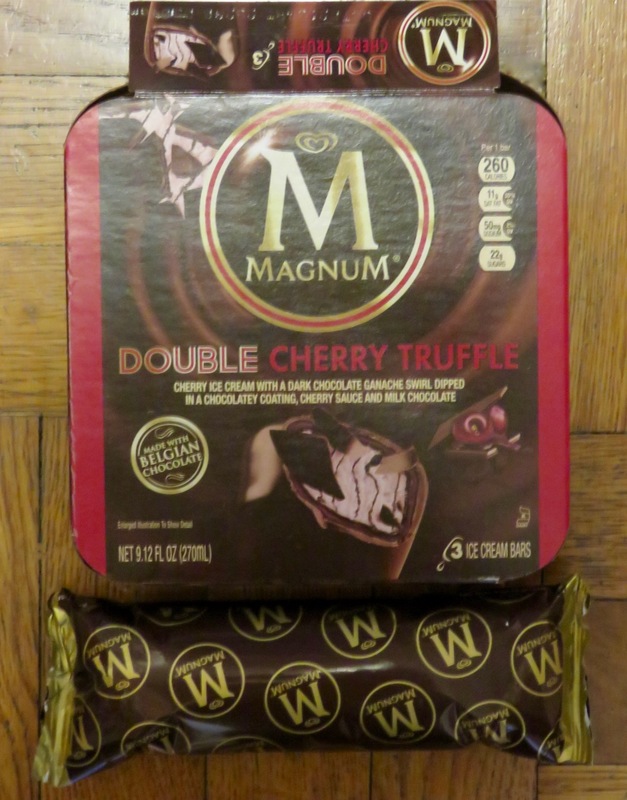 Each individually-wrapped bar contained cherry ice cream with a "dark chocolate ganache swirl, dipped in a chocolatey coating, cherry sauce and milk chocolate." Complicated and mysterious, in a good way. 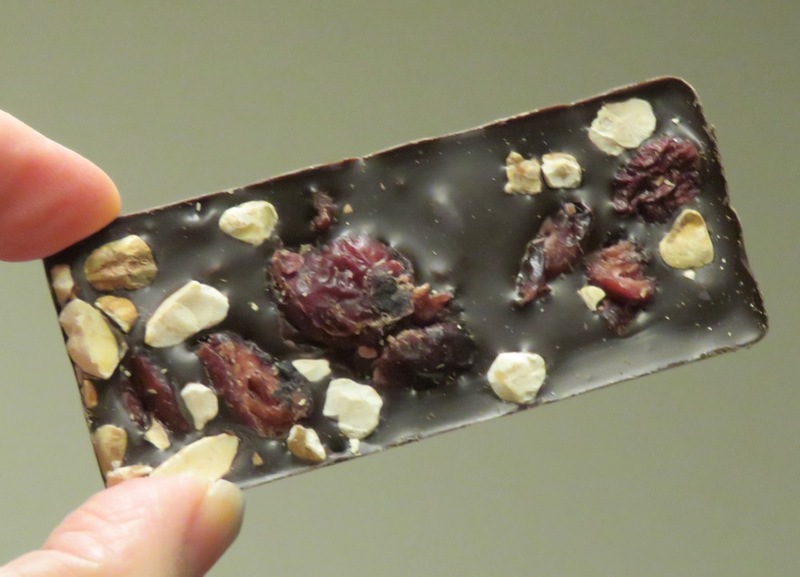 Made with Belgian chocolate, this bar was quite tasty, even if the long list of ingredients was a little off-putting. *Unilever and Nestle are the global market leaders in ice cream. According to one source, Unilever owned an estimated 400 different brands worldwide in 2016. 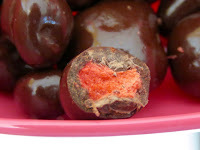 Today's Signature Reserve Chocolate Covered Apricots were from Torn Ranch (Petaluma, CA). 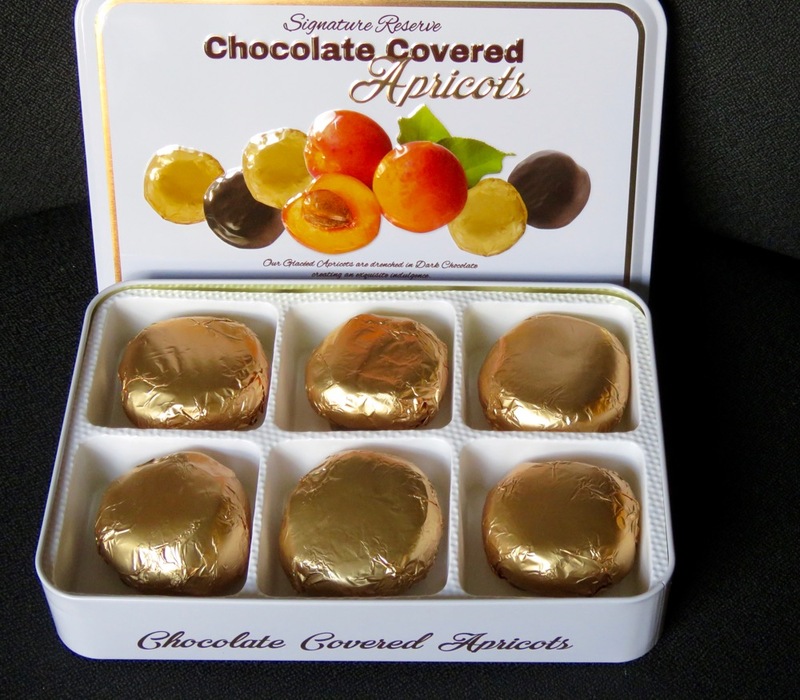 An embossed tin contained six, large (whole) California glace apricots covered in signature dark chocolate. 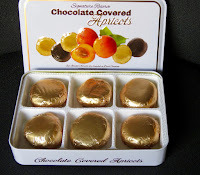 Each plump, premium apricot was wrapped in gold foil. 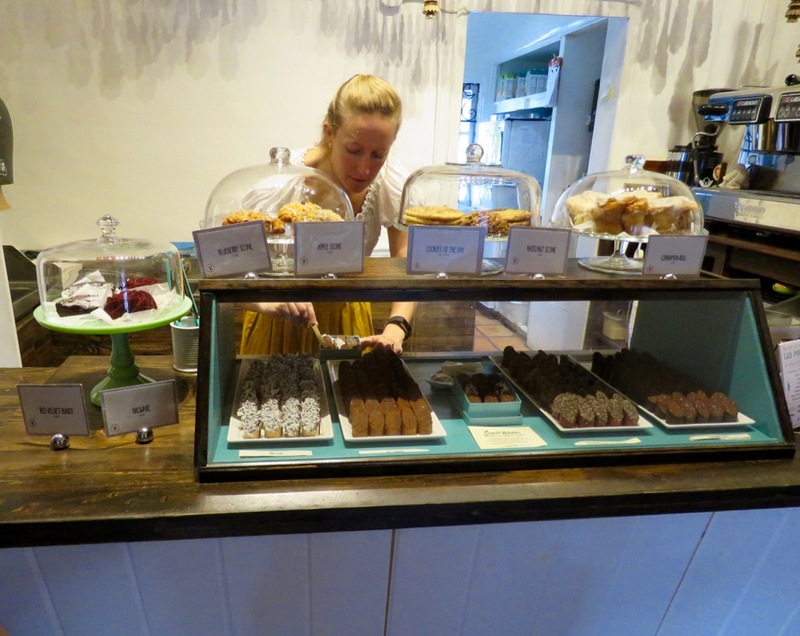 Located in the Napa-Sonoma wine country, the self-professed foodies at Torn Ranch have been specializing in fruit, nut and chocolate offerings for decades (40 years). And it shows. 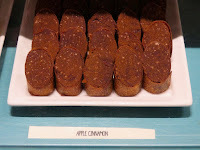 This morning's Apple Cinnamon Super Nibbles were from Nibble Chocolate (San Diego, CA). These chocolates were infused with a touch of warm cinnamon spice, wrapped in a thin sheath of golden brown, naturally sweet apple (think fruit leather) and sliced diagonally across the top for a unique look. 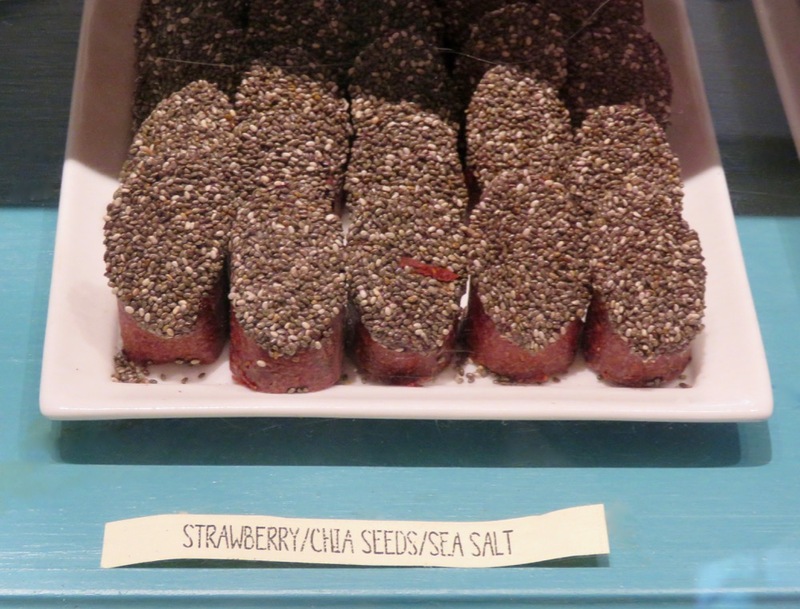 These Super Nibbles would be at home on any holiday dessert plate. Welcome to Day #6 of Chocolate and Fruit Week. 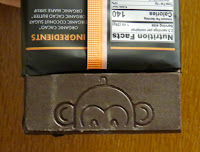 Today's confections were from Nibble Chocolate (San Diego, CA), and were purchased (as part of an assortment box) recently from Nibble Chocolate's Old Town San Diego location. 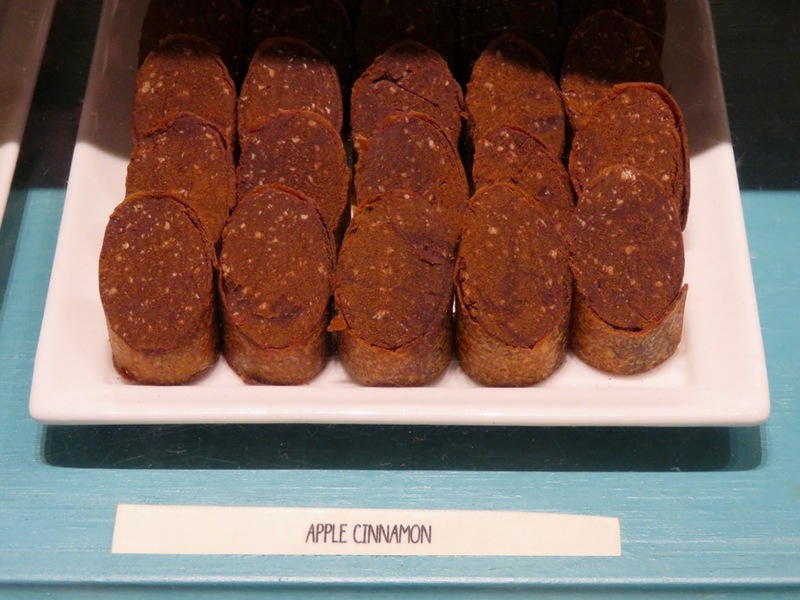 These uniquely-shaped, cylindrical confections, diagonally sliced, were full of natural flavor. And the thin sheets of fruit that formed the outside wrappers added a touch of color and the perfect amount of fruit sweetness, without these chocolate Super Nibbles being too sweet. 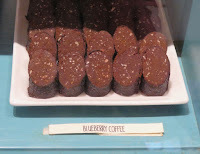 The texture was hearty with a soft chew; and the chocolate filling was made with quality chocolate. 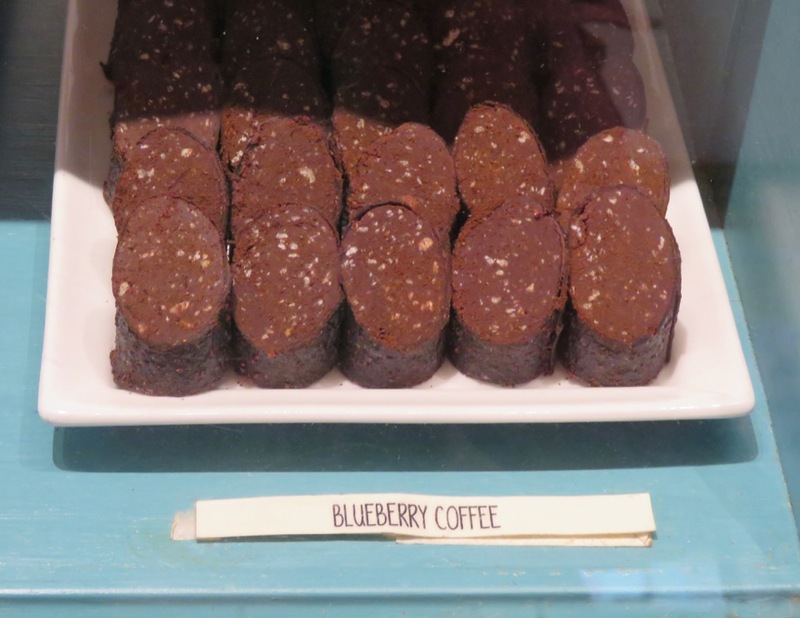 The Blueberry Coffee flavor will please coffee-lovers. 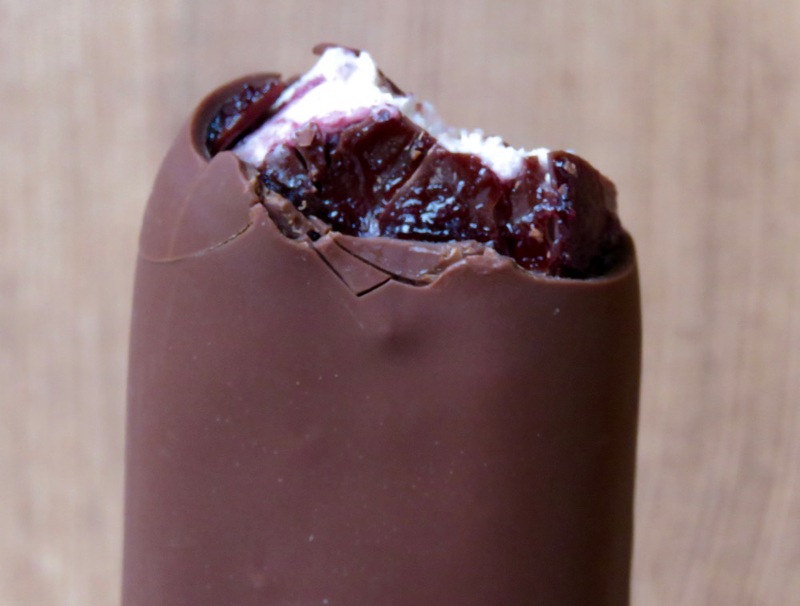 Fresh berries are harder to find in December, which is why freeze-dried fruits and powders adorn many seasonal chocolate bars. 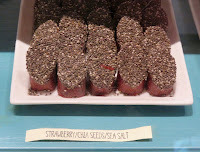 Freeze-dried fresh fruit can perk up confections as well. 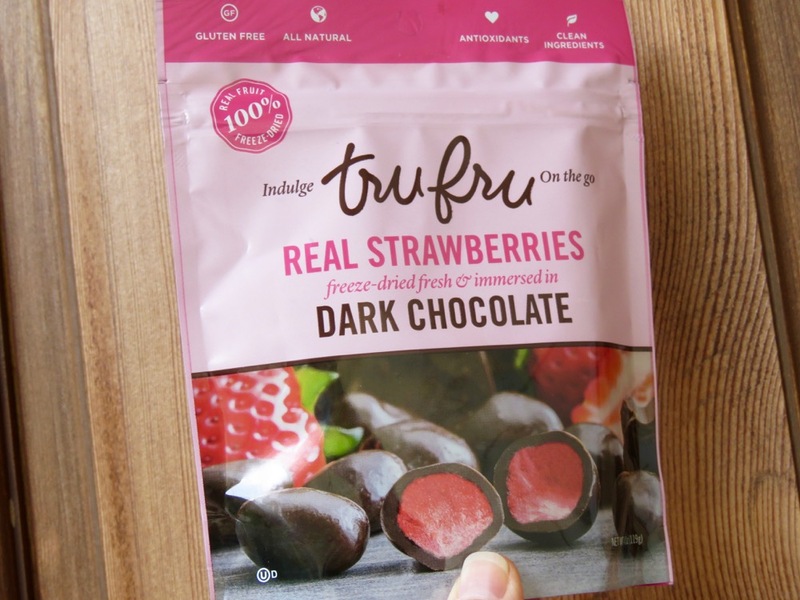 Tru Fru, LLC (South Jordan, UT) offers an entire line of freeze-dried fresh fruit pieces ensconced in glossy chocolate. 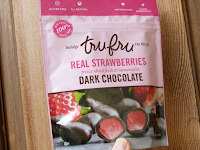 Today's Real Strawberries freeze-dried fresh and immersed in Dark Chocolate from Tru Fru, LLC (South Jordan, UT) yielded bursts of slightly crunchy, pleasantly tart, fresh strawberry flavor. Welcome to Day #4 of Chocolate and Fruit Week. 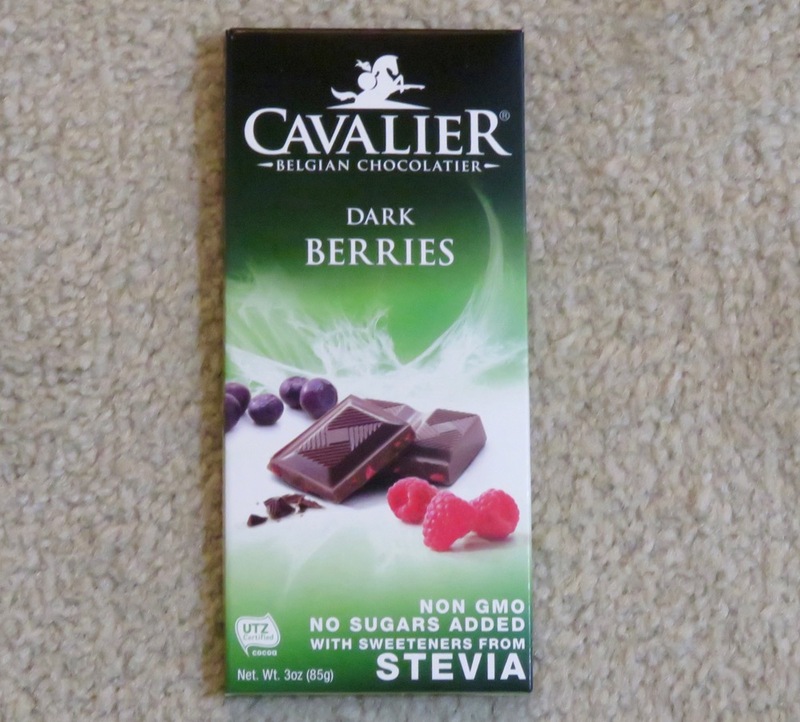 This Non GMO dark chocolate bar, made with UTZ certified cocoa, was made without conventional sugar. 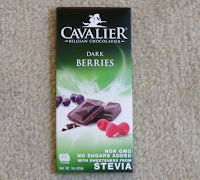 Instead, the relatively smooth bar incorporated "sweeteners with stevia. *"
The sweetener blend was relatively natural tasting; although the ingredients list was a bit long. And with increased processing and each added ingredient, in any bar, there's a possibility natural cocoa notes will be muted. 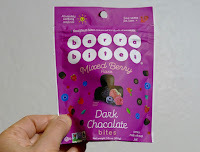 The balanced berry flavor blend included raspberry, blueberry and black currant. 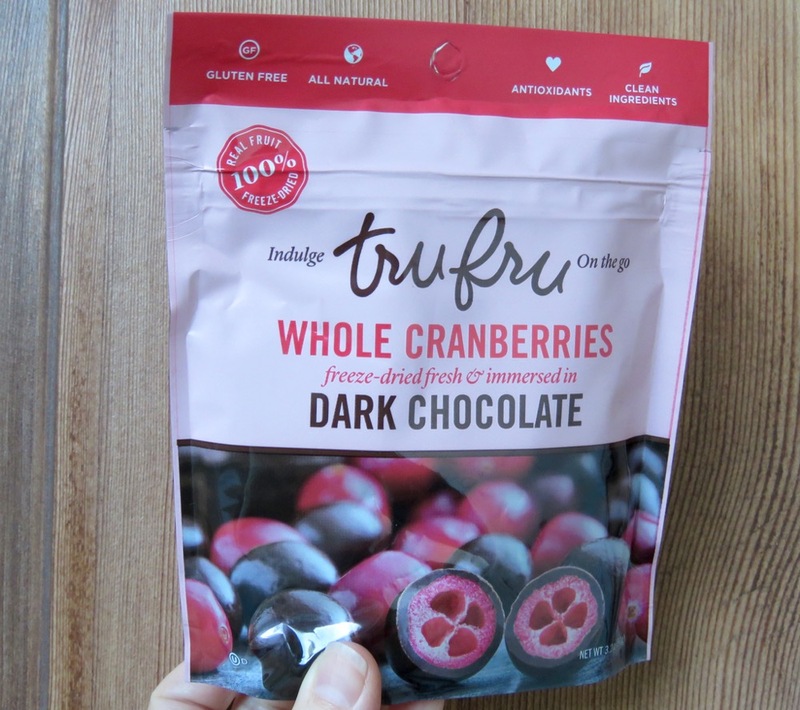 *Ingredients: Unsweetened Chocolate, Dextrin, Erythritol, Cocoa Butter, Inulin, Oligofructose, Dried Raspberries, Dried Blueberries, Dried Blackcurrants, Soy Lecithin as an emulsifier, Vanilla Flavor, Steviol Glycosides as a sweetener. 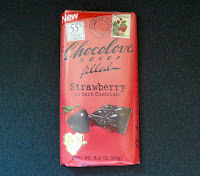 Today's Filled Strawberry in Dark Chocolate bar was from Chocolove (Boulder, CO). 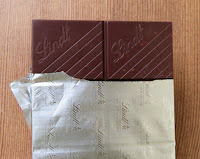 This semisweet dark chocolate (55% cocoa) bar was filled with pillows of strawberry marmalade. 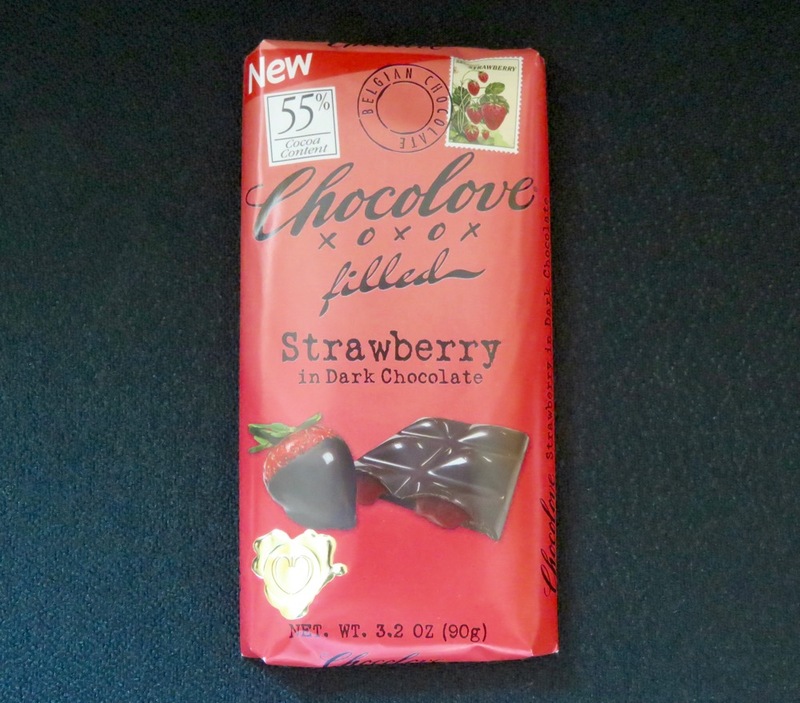 The chocolatier's description included these words: "The subtle fruity notes of African cocoa beans playfully swirl together with the sweet tart flavors of fresh ripe strawberries." This week is focused on fruit. However, if this was a chocolate and poetry themed week, then Chocolove bars and confections would certainly be highlighted. 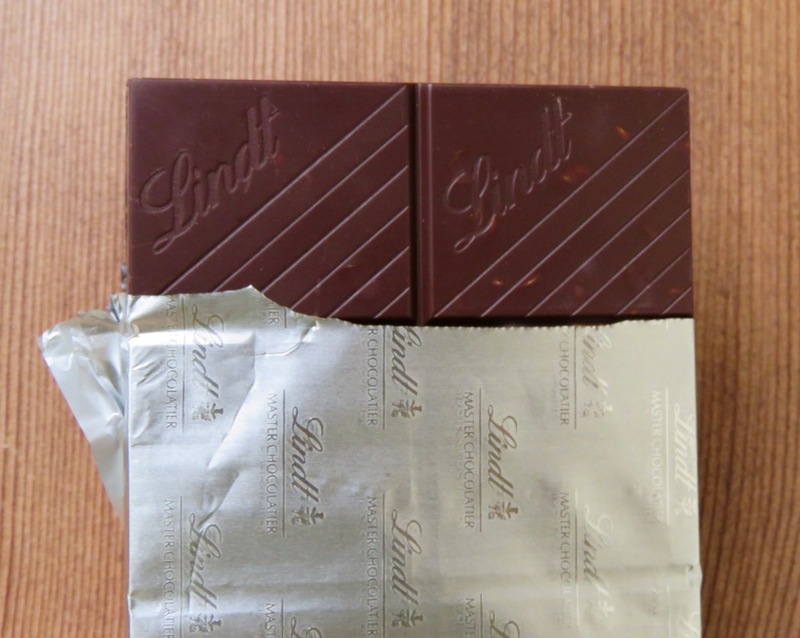 The company has included printed verse on the inside of their chocolate wrappers almost as long as they've been in existence (1996). Today's piece: "Sonnet 49: Against That Time, If Ever That Time Come" by William Shakespeare. Not exactly a joyous ode to strawberry picking and chocolate sampling on a light summer's day. It was more like spotting approaching dark winter* clouds; but it was thought-provoking nonetheless. *We're bracing for winter here in Northern California. 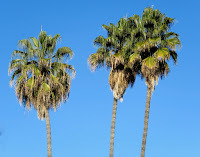 Winter is only 8 days away; but the palm trees outside betrayed no trace of the season's change today. 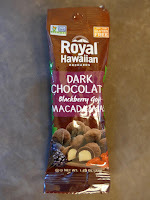 Royal Hawaiian - Macadamia Nut, Inc.
At the heart of today's Dark Chocolate Pomegranate Mango pieces were roasted, Hawaiian-grown macadamia nuts from Royal Hawaiian Macadamia Nut, Inc. These "mac" nuts were covered in dark chocolate and infused with pomegranate and mango flavor. Welcome to Day #1 of Chocolate and Fruit Theme Week. 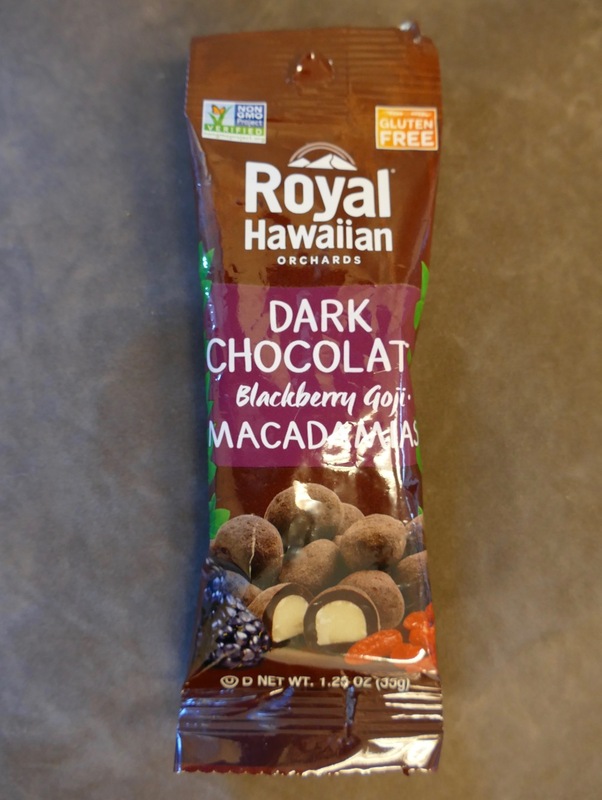 Today's Dark Chocolate Blackberry Goji pieces were made possible by the Royal Hawaiian Macadamia Nut, Inc.
Roasted, Hawaiian-grown macadamia nuts were covered in dark chocolate and infused with tart blackberry and tropical goji. 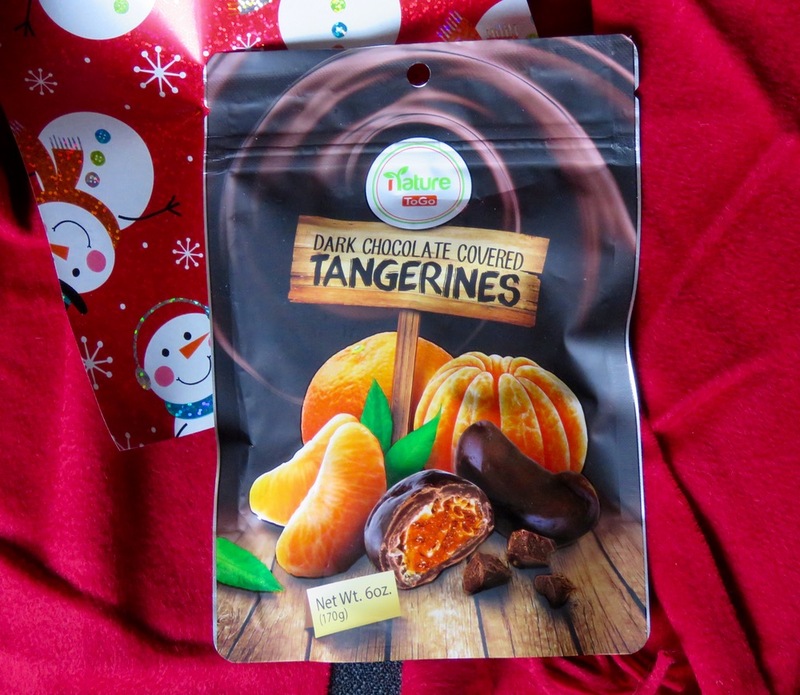 A fruity, berry aroma wafted up to greet the taster, after this snack-size package was opened. 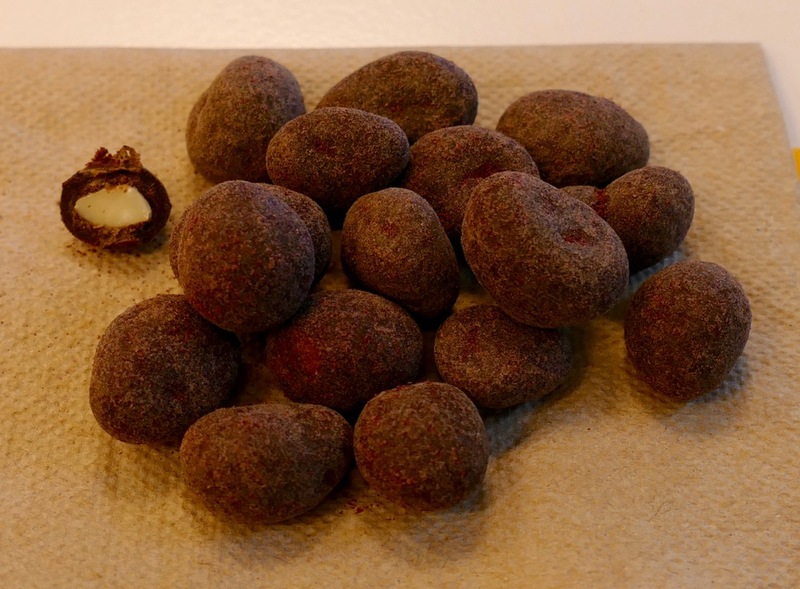 The macadamia nut centers were mild and had a soft crunch.